I’m back! It’s over! I’m married! No more planning! Okay… so it wasn’t that bad, but I am extremely happy to be a married woman even if it’s only been two weeks. Mom and I are still working on adding up the total spending, so I’ll have to get back to you on that, but we were extremely happy with the way things turned out! We had so many compliments about the decorations, the way we had things organized, the music, and the food! Speaking of food… we ordered way too much. For future reference, and a quick trip to my soapbox, it’s not neccesary to order “extra” food. Inevitably you will end up with fewer attendees than you planned on. We had many people come to us in the few days before the wedding and tell us they had something come up and couldn’t make it… and that’s fine, but we also had people tell us they were coming… definitely. Then on the big day they were no where to be seen. My mother-in-law even tried to reach a few people via phone to make sure they were okay and she got no answer. Who would’ve guessed people could be so careless? Not that I’ll hold it against them that they didn’t make it to my wedding, but what happened to the common courtesy of calling a friend? Anyway… that was a minor issue… and one that I really didn’t even think of until after the honeymoon. So ultimately it had no effect on my enjoyment of the wedding. It was a wonderful day. We had tons of fun and were very pleased to spend the day with so many people who love and care for us. 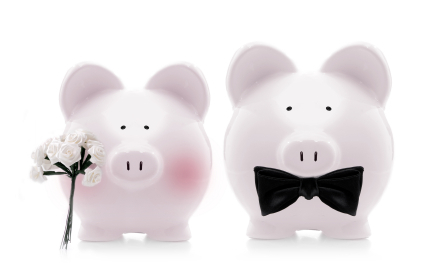 I love that I was able to have a very nice wedding on a budget without feeling constricted by a budget. I’ll try and get some pictures up soon – so people can see pictures of the decor for an affordable wedding! Amanda is a 27-year old marketing manager for Central National Bank. She enjoys spending time with family, friends, and her dog Squirt.